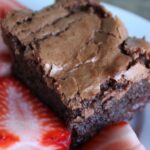 These brownies have everything I dream of in my chocolate desserts. They are chewy, cakey, fudgy, gooey and delicious! Plus, they are perfect with fresh strawberries. Is there a chocolate in the world that isn’t lovely with fresh berries? I’ve been baking my way through my favorite dessert recipes this year and seeing which ones can be adapted for baking with freshly ground wheat. I am addicted to my Nutrimill and I love finding new ways to use wheat to replace the standard AP flour. I was absolutely thrilled to discover that this recipe adapted perfectly for use with whole wheat. There was no noticeable change in the taste and I promise that you could not tell the difference. I actually prefer the whole wheat version to the original. Adjust oven rack to lower-middle position and preheat oven to 325 degrees. Whisk flour, salt and baking powder in a small bowl; set aside. Spray an 8-inch baking pan with baking spray and then fit a sheet of foil in pan and up two sides, so you can use it as a handle to pull cooked brownies from pan. Spray foil with baking spray. Melt chocolates and butter in a medium bowl over a pan of simmering water. Remove from heat; whisk in sugar and vanilla. Whisk in eggs, one at a time, fully incorporating each one before adding the next. Continue to whisk until mixture is completely smooth and glossy. Add dry ingredients, whisk until just incorporated. Stir in additional chocolate, if desired. Pour batter into prepared pan; bake until a toothpick or cake tester inserted in center comes out with wet crumbs, 35-45 minutes. Cool brownies in pan on a wire rack for five minutes. Use handles to pull brownies from pan. Completely cool brownies on rack, at least three hours. Cut into squares and serve. If not serving immediately, do not cut brownies. Whole brownie cake can be wrapped in plastic wrap, then foil, and refrigerated for up to five days. Enjoy! If you wait until toothpick inserted comes out clean, they will be overcooked. You want fudge-like crumbs. Those look amazing. I am going to ask my wife to bake me some! Thank you for visiting my blog as well! 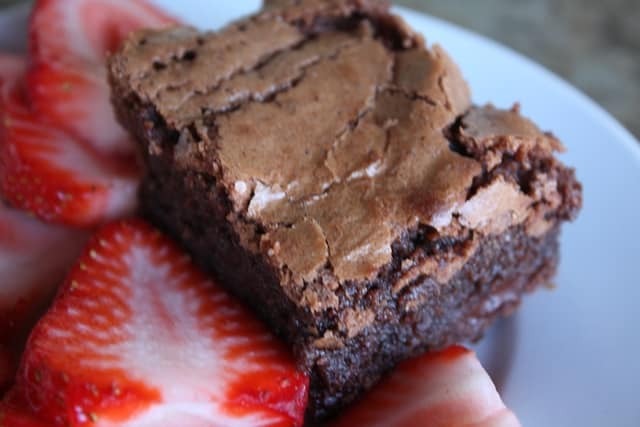 Love the idea of whole wheat brownies!! Any subs for the butter? You can sub a light flavor (not EVOO) olive oil for the butter and they should remain basically the same. In the past, I've used applesauce, yogurt and sour cream to replace the oils as well. As for the taste, it is unlikely to remain the same without an actual oil or fat in the recipe. In my own opinion, most desserts are worth making with the original ingredients. One of these is far tastier than several of the lower fat versions I made years ago. Made them yesterday and they are delicious!! Can I double the recipe and use a larger pan? Sorry I missed the question initially, but yes, you can easily double the recipe! How do you think spelt flour would do in this recipe? I have no idea, Sarah. I've never worked with spelt flour. If you try it, let me know how it works! These were so good, I ate the whole thing! Is there a measuring cup equivalent to 3 ounces of chocolate chips ?